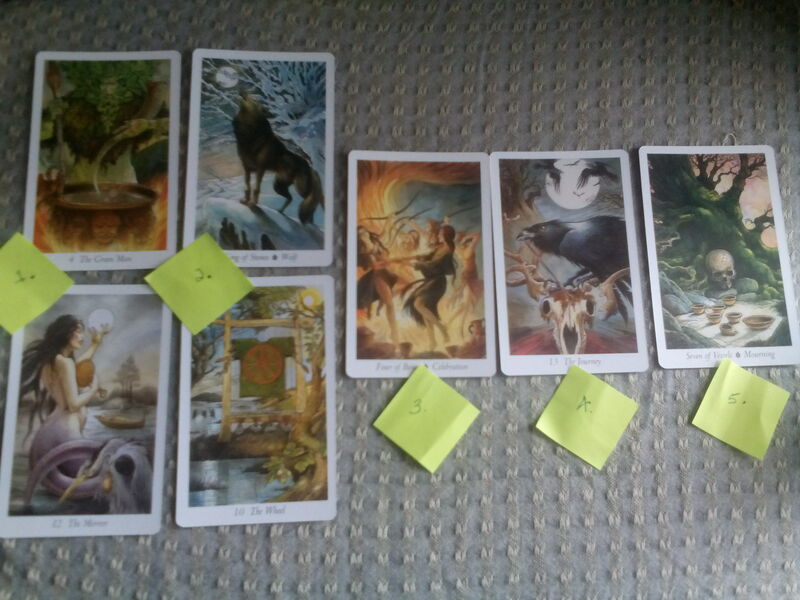 A spread on tarot reading, and my tarot reading in particular, using the Wildwood Tarot. There’s nothing like a spooky tarot reading right before Halloween! Never let it be said that I don’t subject myself to the same sort of soul searching that I often seem to encourage in (I almost said “impose on,” but am I really that bossy? I think my soul searching is a little more laid back) my clients. It’s not easy to interpret cards for oneself, and, in addition, I am still learning the Wildwood, so I won’t interpret these cards extensively here, but will instead comment somewhat…sketchily. I chose this spread to ask for feedback from the universe about my own tarot readings in my tarot business. Apparently this spread, called “A Spread on Tarot Reading, by Marion,” comes from the Aeclectic Tarot Spreads eBook, Aeclectic Tarot, 2007. I found it somewhere on Facebook, in a meme, a long time ago and saved it to try, apparently, today! 1. What I already do well: The Green Man and The Mirror (The Hanged Man) (Two cards popped out of the deck at me here — the same thing happened for position 2, as well.) Male and female energy, creative energy combined with a willingness to dig deep in a search for wisdom. Patience and prudence are emphasized here as well. I have always been good at patience — but I may also be a little too willing to be patient — see position 2. 2. What I need to work on: The King of Stones/Wolf, and The Wheel. The Wildwood tells us that the Wolf is not only a hunter and a tracker, but also a guardian of the dead on their journey to the underworld. Does this mean I should learn to be a medium? Or does it mean I should focus on my work with people who are to some degree feeling dead within life itself — people who are depressed, people who feel or who actually are close to death (either their own or someone else’s)? Or with people who fear various kinds of death — who are terribly anxious? 3. External resources for improving: Four of Bows/Celebration. This seems like the least mysterious of the cards in this bunch. Relaxing with friends, enjoying the advice and support of others around me. This has always been a weakness of mine — I’m such a quiet introvert — but I plan to work on those skills at a wonderfully awesome business retreat this weekend. 4. Internal resources for improving: The Journey (Death)/The Raven. The card of Samhain. Um. Yes. The Raven is a guardian of spirits of the dead, who, like the Wolf, might usher the dead into the next world. The Wildwood tells us cheerfully, “Once the dead were not feared. They were seen as guardians, holy ancestors and holders of wisdom,” and comments also, “let the bones be laid bare.” It also mentions the dance of death, defleshing the corpse, purification by fire. SUCH a cheery card — but also probably very appropriate for a Scorpio who loves fall and rain and dark of night. Gulp.